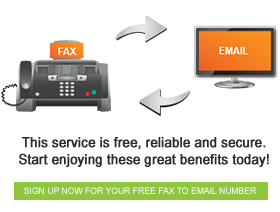 Fax to email solutions are usually aggressively marketed to corporate clients. That often leaves individuals who work from home or those who simply need fax to email at home to figure it all out on their own. If you have ever wondered if you will be able to enjoy the service from home, the answer is a resounding “Yes!” You can enjoy free fax to email from home. Over and above the above the mentioned benefits you can enjoy even more advantages including the fact that you will never ever have to worry about losing the faxes when your email server is down as they will never be lost, but will be queued. The ability to send and receive faxes from anywhere in the world, as long as you have a reliable internet connection makes fax to email a true communication essential. Contact us to find out about the various rates and packages we have for you and start enjoying the convenience of fax to email today!